S7 Airlines is one of Russia’s largest airlines and it has the largest network in the country. Based in Moscow, S7 Airlines has a young fleet of more than 55 aircraft connecting customers across its network of more than 145 destinations in 33 countries in Europe, the Middle East, and the Asia-Pacific region. Book nowBook now with S7 AirlinesOpens an external website in a new tab. Earn and spend Skywards Miles on S7 Airlines flights across S7's network of more than 145 destinations. Take AdvantageTake advantage of the offers from S7 AirlinesOpens an external website in a new tab. The number of Skywards Miles you earn will depend on the class of travel, fare type, and distance flown. Book with S7 Airlines and give your Emirates Skywards membership number to earn Skywards Miles. Book your S7 reward flight from just 7,500 Skywards Miles using our online request form. The table below shows the number of Miles you need for a one-way reward flight. Round-trip rewards will require double the number of Miles given for a one-way reward ticket. You can use your Miles for travel in either direction between reward zones. The list of destinations in the table is subject to change. 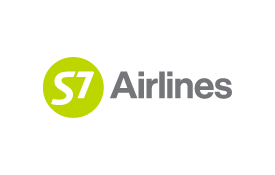 Please check the S7 Airlines website (opens external website in a new tab) for the latest information. Codeshare flights operated by airlines other than S7 are not eligible to earn Miles. The following fare types are not eligible to earn Skywards Miles: O, Q, I, U, P, W, G, X, and E.
Miles cannot be earned on the following flights and ticket types: Charter and special flights (S7 8000–S7 9999), Group Inclusive Tours (GIT), Inclusive Individual Fares (IIT), reward tickets, and free ticket promotions. Reward tickets can only be issued on S7-operated flights (flights with the flight code S7). Reward tickets are not valid on codeshare flights operated by any carrier other than S7 or S7’s airline affiliates. Miles can only be redeemed for reward bookings on S7 in Economy Class and in Business Class. Miles cannot be redeemed for charter or special flights (S7 8000–S7 9999). Reward flights are available for one-way and round trips and are subject to availability. S7 flights must be confirmed at the time of Miles redemption. Waitlists are not permitted. A rush reward fee of US$50 applies for bookings made within 7 days of outbound travel.